I try my best to follow up with our winners shortly after their names are posted. If you do not hear from me within 2-3 days, please e-mail me at ksmith@papercraftsmag.com. If a prize goes unclaimed for more than two weeks, an alternate winner will be selected or it will return to our prize vault and be used at a later date. Note: Unless otherwise indicated, our winners are always selected at random. Also, we are no longer able to ship prizes outside of the U.S. HOWEVER, this doesn’t mean that you can’t play. You can absolutely comment your socks off, but if your name is drawn, instead of winning the prize that’s being offered, you’ll receive a one-year subscription to Paper Crafts magazine. So keep your comments coming, friends! I am new and need a lot of direction. Have done scrapbooking but for some reason find myself challenged. Give me some ideas. I am new member to your site! I love it…..
Hi, I am not new to paper crafting, but am new to this site. I Love it! I am addicted to stamping and have enjoyed the craft for a very long time. I always look forward to getting my Paer Crafts magazine! So many ideas, so little time. Love the site! To enter one of our contests, just leave a comment in the blog post it’s announced in. For example, every Friday we give away prizes in our “Freebie Friday” blog post. If you look right under the title of the blog, you’ll see a tag that says “Comments”. Click on that tag and leave a comment. You’ll automatically be entered to win! I found a card by Teri Andersson Happy Cupcake card. Would you be so kind to email me the directions as I have a lot of children to send cards to and would love this card. I love you magazine. I have found a lot of new ideas for cards. I just re-subscribed to the magazine and can’t wait to get it again. It had alot of inspiration for us that are not so creative. I am new to finding your blog (and magazine!) and really look forward to reading it! i just found your blog and love it. i am VERY new to blogs and have been spending lots of time looking at blogs and getting ideas now i have to go to my craft room and do them so thanks for all the great ideas. I am so excited that you have a blog since I love your magazine. As you can probably tell I love all the tips and ideas that you offer and info about new products is a bonus too. What fun, too bad we can not get things shipped to Canada. 😦 But thanks for wanting to. I love visiting your blog, so many great project ideas and information. Thanks for sharing. I’m new to your site but, I am pleased to see all you have here. I will definitely become a follower! Thanks for sharing all these great ideas. I have a collection of Paper Craft magazines via 5+ years ago but I am new to this website/blog. I love the magazine and the blog inspirations! I love Papercrafts magazine!!! I have found your blog recently..love it. Great Cosmo Cricket collection..TFS. Hi, I’m new here and it looks like fun. I love paper crafting especially card making. So I will be back. I’ve been coming for a long time and looking around. I thought I’d try interacting a little bit! Great magazine, great ideas. Thanks! I too am new to scrapbooking and this site. I am clueless as to how this all works, but would love to enter the contests and get cool stuff! Plus, I would like to learn more about the how-to’s! This looks like so much fun. Thanks for sharing! I have been a subscriber and I still am, although I have just discovered this blog how COOL is that!!!!!!!!!!!!!!!!!!!!! I just subscribed to Paper Crafts and I really like the ideas that are inside the magazines. I found this link and was automaticly interested. So I hope to come back and visit when I can. So fun to see all of the great ideas floating around out there. They make me think outside my box. I love that ya’ll love to give away prizes. Your ideas are spectacular! I have been getting your magazine for years now and love each and every one. The ideas and bonus ideas are wonderful. I appreciate all the work that goes into making the magazine. I have just signed up for the blog, so this is new to me. Papercrafts gives me tons of ideas! Thanks! I have been getting Papercrafts for sooo many years. So long, it used to be called just “Crafts” I believe. Thanks for all the wonderful ideas and bonus web projects. Papercrafts is the best magazine I’ve seen for cardmaking AND scrapbooking. Wonderful, simple ideas! Love it! p.s. please add me to follow up comments! I just updated my favourite blogs to my new laptop, including Papercrafts! Yahoo! Tomorrow is my last day before heading back to work in Kindergarten. I will be doing some thank you cards for the kids. Sure that the blog will inspire me as well. Woo Hoo ! I love giveaways!!! Hope I win one!! I am new to blogs so I am limiting myself to this one for now. I love Paper Crafts! I have made well over 500 cards and still enjoy the process from start to finish. I always look forward to your magazine. Thanks for the ideas you have given me along the way! Someday soon I hope to submit one of my own creations. A new year with new pens, papers and pictures…hence, it’s a Happy New Year! Any idea will be a welcome help to a newbie like me. Any tool is a great addition to my growing project box. Thanks for all the great ideas! Thank you so much for such a super mag. I have been a subscriber for a few years now and it is the best out there!! I’ve been enjoying your magazine for a few months and am now a new subscriber. I just, however, discovered your blog, and now, Im getting double enjoyment. My nieces and I do quite a few craft shows and appreciate the new ideas. Thanks for the innovative and bright ideas. I have just purchased my first Paper Crafts magazine. I’m already hooked and inspired. I let my subscription lapse but pick it up w/my J’s coupons on a regular basis. Where is the subscribe button anyway… I’ll find it! Thanks for always being on the cutting edge of trends and beings so inspiring! I’ve been reading PaperCrafts for a number of years and love all the new changes to the magazine. The new look is so inviting. Also love love love the latest Stamp It! special issue — crammed full of great cards and awesome techniques. Thanks PC for remaining the go-to paper crafting magazine! Would love to win a subscription to Paper Crafts Magazine! I have been making cards for about 20 years now and still love how every year they evolve into a style a bit different from the last! New Year Resolution – to try my hand at more paper crafts! I look through the magazine and ooh and aah, but need to get a little more organized and just do it! i finally have a huge library of paper and stamps to do alot more paper crafts. woooohoooo! im so tickled to be doing alot more pc’s. i am now making everyones bday cards at church so they dont have to worry about it. and its doing something i love to do! i also now have some embossing products to try on the cards. wish me luck with that. lol!! now i need to go out and get the pc card creations mag it looks too cool. i just now got a glimpse at it today. ok going to make a bday card now. Would love to win to get some new stash and great ideas! You have really good projects as I am a crafts teacher at a Senior Center and they do not cost a lot as I have to work on a buudget. Thanks for the ideas. I just catalogued my Paper Crafts magazines!! It was so much fun! I sat for a few hours admiring all the beautiful work. My good friend and I scraplifted a card. It came out beautiful! We were so proud of ourselves! Thanks, Paper Crafts. I would love some freebies 🙂 I only have a few stamps so limits my submission abilities! I subscribe to your magazine, which I LOVE, and just discovered the blog. Loving it! So many great project ideas and information. Thanks for sharing. I would be lost without the inspiration I find on your blog. And I love that your mag covers all the ranges of paper crafting. I really enjoy making “pretties” for my friends and family and you always have a bunch of things for me to try my hand at. Hi, Your blog is a real inspiration. Today is my first visit to this blog and it was heartening to see that you are motivating non – US crafters. Being a non – US crafter I know what it means. Thanks a ton !! Keep motivating !! I learned about your site while waiting in line at a local craft store. I am not new at scraping but I am new to stamping. The person I met today said she got coupons for Hobby Lobby and other craft stores. Where are they located. I have really enjoyed my first visit to the site and know I will be returning often. I found your blog through Paper Crafts magazine and what a joy. Love the great ideas. Thanks for the fun giveaways, too! I am pairing down my cardmaking subscriptions but Paper Crafts is one I just renewed for 2 years. I really enjoy this magazine. I have used quite a few ideas from it. Keep up the good work. hello i am excited to say that i am getting to subscribe to papercrafts today!! i am so excited that i am finally getting a card mag sent to my door instead of having to hunt them down at the stores. i chose the papercraft mag cause they give insperations for the inside of the cards i have problems doing the insides so thank you so much for the ideas. also is there anyone that has worked with alcohol inks i just placed an order through joanns so i have some inks and the solutions on their way. but i was just curious of how hard it is to do. well thank you again for the hundredth time for all the ideas. keep it up! Thank you so much for your Fabulous magazine. I have been a subscriber for the past two years and love to read each issue from cover to cover. It’s such a gift , receiving so many great ideas and inspiration! I just LOVE your magazine! I have been a subscriber for about 4 years and always feel I’ve received a special gift when it comes in the mail. Every issue is always packed with inspiration, new ideas and products and a ton of info on “how-to’s”! Thank You…Thank You…Thank You! I have subscribed for several years now and always find lots of fun projects to try. Thanks for all the wonderful ideas. Keep them coming! Love the magazine. I have found many ideas for cards and scrapbook pages. Thanks for the great layouts and information. What wonderful ideas and articles in your magazine ! I’m submitting after reading Kimberly article … for the Flourishes giveaway. Thanks for the opp ! Love your magazine! Discovered it through the library and loved all the creations!! Cool! Who doesn’t love giveaways! Yeah, right here!!! Awesome prizes!!! Stamps are so economical. They can be used over and over again in many different ways. You can mix and match your stamps from different sets to make something new and different. Would love to win these to add to my collection! Yes! I can win, even if I’m not living out of the country! How fun it’d be to get a magazine in English! 🙂 I came on here via Kim’s blog – I just love her creativity! I love making cards. What I need is to overcome my hesitancy to scrap. I know if I could just get a few pages/layout under my belt I’d love it. Oh but where to begin? I have only been stamping for about 6 months, and I am hooked! My sister started me, and I have not been able to stop – wait I don’t plan to stop! I love to create and stamping enables me to make many gorgeous end products in a short amount of time. Im new to the satmping, card-making , scrapbooking fun!….but im learning as i go….would love any suggestions? I hope I get picked as I LOVE veggies and I have a sweet little Pomeranian dog named….guess what?…..Sweet Pea! Please enter me in your drawing. I love these papers. Your magazine is awesome! I especially love all of the ideas for cards! Please enter me in the drawing. Thanks! It’s always nice to try and win some fun goodies on your blog! Thanks for all the giveaways! New to your website – BUT – definitely not new to you wonderful magazine. Thank you for the oppotunity to win some goodies!!! I’m enjoying the site. Thank you for the free downloads and wonderful cards. I’m new to this site. Going on a SB retreat in about a month and can’t wait. Thanks for all the examples! I’ve gotten your magazine for years and have been so inspired by it! It’s funny though, this is the first time I’ve been to your website, it’s as wonderful as all of you. I started making cards a number of years ago, then signed up as a demonstrator, ‘to get the discount’. I had the time of my life, but now have decided I just want to play with it again. Right decision at the right time. It seems that now my creativity is really starting to pop out there, and I am LOVING it! I’ve subscribed to PC for many years and LOVE IT! One of my favorite sections of the mag is the Go-to Sketches — so cool how people interpret the sketches in different ways. I would sure love to win a copy of the new special edition “Sketch It”!!! Thanks for the wonderful mag and great websites / blogs!!! I love PC magazine. I agree that the sketches are very helpful to get my creative juices flowing. Love this blog! I am just beginning to make cards and have found your magazine very inspiring, I’m having the time of my life. Thanks for sharing this blog as well. I would love a PaperCrafts subscription. I like to surround myself with things that inspire me. I love paper Crafts maganize. I would love to win the giveaway. Just love all the creative ideas that are shared on the blog…I’m more of a card crafter and projects for gifts. Keep those great ideas coming and winning a prize wouldn’t be bad either! 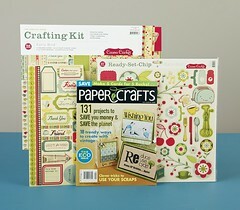 I would love to win a subscription to Paper Crafts! Love the magazines–regular and special issues. Just found your blog even though I’m a PaperCrafts subscriber! How did I miss this site! Love it and thanks! I just discovered “Stamp It! Cards”, and then just a week later the “Paper Crafts” Mar/Apr issue and am in love! What great magazines! Great cards, great layouts, great photography, & great ideas! I especially loved the Color Play article on pg. 33 & 34 of PC; I used the color combo and was really pleased with how my card turned out. thanks!!! I guess I’m going to have to subscribe because you have me addicted!! I love your magazine, in fact, I just re-subscribed for 2 more years & I didn’t even KNOW you had giveaways!! What a great surprise : ) One (yes, just ONE) of my fav things is the Tips, Tools & Techniques section – love discovering new stuff I HAVE to have : ) Thanks for being so awesome ! I absolutely love my “Card Ideas for paper crafters” Volume 1. I bought it back in October 2011, and can’t get bored with looking at it and getting ideas for the cards I love to create for people. I’ve even fallen asleep hugging my magazine ;oD Thank you Paper Crafts for this wonderful magazine.